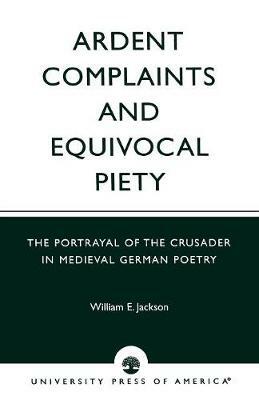 Ardent Complaints and Equivocal Piety treats three sets of medieval German crusade poems, in most of which the crusades are pictured as a source of distress, disenchantment, or even annoyance. The first group portrays the crusader as he tries to overcome strong reluctance to leave his home and loved ones. The second group, by some of the same poets, features the woman who is about to lose a beloved man to crusade duty and clearly objects to it. The third consists of three poets who give the impression of crusade involvement, but an impression that remains intriguingly unclear. These groups of German poems are treated against a background of Latin crusade poems in which the crusades cause stress and distress of a different kind.